A pet’s teeth are meant to last a lifetime, and Lawndale Pet Hospital can help you ensure that they do. While most people would never think to go without caring for their teeth and general oral health, many forget that pets need dental care too, and they are largely dependent upon their families to provide that care. Why do pets need a healthy smile? While regular oral health measures will give a pet a pretty smile and fresh smelling breath, the goal is even more about the pet’s overall health. Systemic infections — When plaque builds up on a pet’s teeth, it can allow bacteria to infect the gums. As the gums become inflamed, bacteria can enter the blood stream and travel to other parts of the pet’s body and cause heart disease, liver disease, kidney damage, and overall loss of health. Quality of life — Just like in humans, diseased teeth and gums in pets are painful. Left untreated, pets can become irritable, avoid eating, lose weight, and become outright miserable. Regular at-home and in-clinic dental care promotes excellent health and wellbeing in pets. What kind of at-home care should pet owners provide? 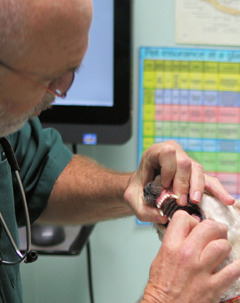 What types of in-clinic dental health care do pets need? Anesthetized pet dental cleaning — Under anesthesia, our veterinary team will remove plaque from both above and below the gum line. Pet pain management protocols are used to keep the pet comfortable throughout the procedure and recovery. Comprehensive oral exam — While the pet is anesthetized, our veterinarian will be able to fully examine the pet’s mouth for any signs of injury or disease. Dental polishing — Once the teeth are clean, polishing is done to provide a smooth surface that is more resistant to bacterial growth. Advanced dental procedures — If diseased teeth are identified, any extractions or additional measures can be taken while the pet is anesthetized. If needed, an antibiotic regimen will be put in place as part of the pet’s recovery. Providing excellent oral health for your pet will promote his or her health and long life, and Lawndale Pet Hospital is here to help. If you have any questions, contact our knowledgeable staff for a consultation.